introduction to dogs came in 1977 when he purchased his first Bernese Mountain Dog, Mon Plaisir’s Sundowner a/k/a Buck. Since that time Paul, along with his wife Mary, has bred, raised, shown, trained and loved several generations of Bernese under the kennel name Ursli. Paul began training professionally in 1991 when he joined the instructing staff at Gemini Dog Training. 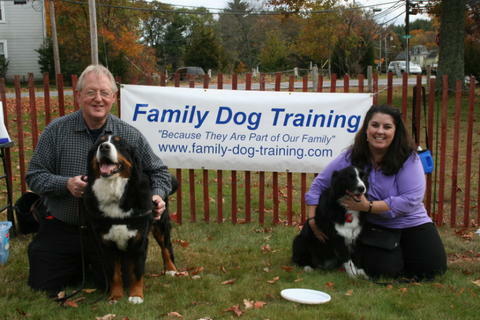 Until founding Family Dog Training in 2008, he was a Senior Instructor and Director of the Pet Dog Training Program. He was one of the first trainers to achieve the status of Certified Professional Dog Trainer when the exam was first offered in September 2001. This certification requires that he actively participate in continuing education to constantly update his knowledge and skills. Paul has spoken both at national dog shows and locally on canine behavior and successful companion dog ownership. He is a Professional Member of the Association of Pet Dog Trainers, former President of the Bernese Mountain Dog Club of Nashoba Valley (covering the New England states), past Rescue Chair of the BMDCNV, and former (and very first) Draft Work Chairman for the Bernese Mountain Dog Club of America. Paul is currently the Training Resource Chair for the BMDCNV and a long-time Bernese Mountain Dog Club of America Draft Judge. Paul is an American Kennel Club Canine Good Citizen evaluator and a member of Truly Dog Friendly, a national organization promoting non-violent, dog friendly training methods. Paul shares his teaching duties between his business, Family Dog Training based in Hudson, Massachusetts, and private training and behavior consultations in the New England region.